Robin Givhan's no fool. The Pulitzer Prize-winning Washington Post columnist/critic must have known that this piece was going to ruffle feathers. Her thesis? Fatties, heal thyselves. Fashion's just doing its job. Her larger point is that fashion, that many big-headed hydra, is merely going to act out like a rebellious teen against the world. They represent the ideal, they don't make it. And if we're getting fat, and hate it, fashion's going to reflect an opposite and aspirational extreme. Because that's what fashion does, it's unattainable - and it never pretended to be anything else. Our hatred of fashion-as-scapegoat is, she's basically saying, about self-loathing, adding, "And some horribly airbrushed photos notwithstanding, the main focus of the complaints isn't that the look is unpleasant but that it's unattainable for most people." With that in mind, maybe all of the protesting about deluded designers has been wrongheaded. Maybe all of the demands that editors and photographers just use heavier models have been misguided. Because before fashion models will get any bigger, people in general will just have to get smaller...Fashion tells us something about ourselves and our culture. It does that by reflecting a heightened or twisted reality. It may be that the only way to change the fashion industry's portrayal of women is not by trying to make sense of the funhouse reflection but reconsidering the original subject matter. the backlash isn't always about health or body image, but about wanting a standard of beauty that actually seems semi-attainable. 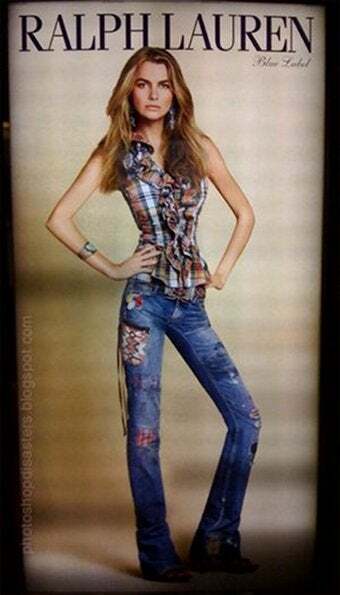 At least you could buy a corset (good luck carrying that Photoshop eraser tool around with you at dinner)...The culture" isn't insisting on emaciated models and greeting larger ones with hostility; the fashion industry is, and as such, it seems increasingly out of touch with consumer demands. To this I'd add that whatever we think of the insanity of corsets, belladonna and foot-binding, never in the course of sartorial history have we been father from the natural ideal: all these things, however grotesque, emphasized characteristics that are associated with health and fertility in some way. Big eyes? A dramatic hip-to-waist ratio? You don't need Anthro 101 to point out the antecendents. (Maybe damaged said health along the way, but you get where I'm going with this.) Design critic Stephen Bayley's new book, ‘‘Woman as Design: Before, Behind, Between, Above, Below," deals with exactly this: the enduring, subconscious - and universal - appeal of the feminine body. Givhan's argument, while it surely contains a kernel of truth, also denies something obvious: modern fashion isn't about beauty, and that's new. It's redefining beauty, and taking out health, which goes against our quite literal instincts. Maybe that's why we rebel, and object in ways we don't even fully understand.